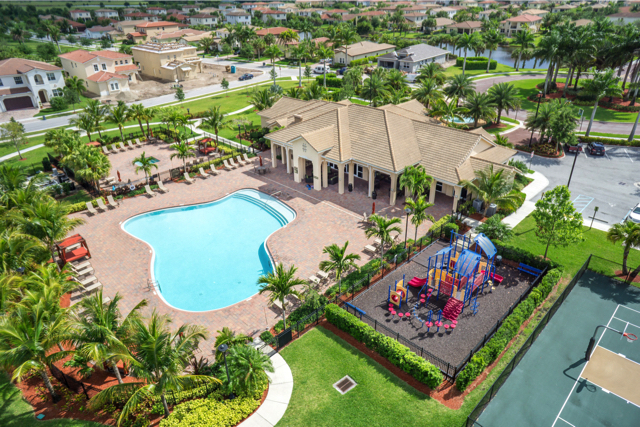 The Rialto subdivision in Jupiter, FL is special for a variety of reasons. As a newer gated community by Lennar, Rialto Jupiter offers home buyers large lot sizes, spacious homes that range from 1,824-4,170 square feet, and an abundance of community amenities that include a clubhouse with an impressive community pool, tennis and basketball courts, and seemingly endless walking paths, park spaces, and playgrounds. Call us today for more information on Rialto Jupiter real estate & homes for sale! As of April 21, 2019 there are 5 ACTIVE homes in Rialto with an average asking price of $668,380. The highest ACTIVE listing price is $969,000, while the lowest listing price is $525,000. These Rialto residences have an average price of $222 per square foot, based on listings with an average of 4 bedrooms, 3 bathrooms, and 3,009 square feet of living space. Find the newest Rialto homes for sale & real estate listings in Jupiter, FL below! The Rialto neighborhood in Jupiter, Florida sits nestled between the North Jupiter Flatwoods Natural Area and Interstate 95. Just off the Florida Turnpike, this gated community offers real estate options for home buyers seeking property minutes from premier golf courses, shopping, dining, and the beaches along the Atlantic shore. Rialto features single-family homes and several on-site amenities for residents and their guests to enjoy. Each spacious, well-designed single-family home in Rialto includes features like quality concrete block construction, tile roofs, durable exterior features, and high-end interior finishes. The subdivision has 312 homes and is in the 33458 zip code of the city. For information about Rialto neighborhood properties for sale or to schedule a private home showing, contact your Jupiter real estate experts today. Ready to begin your search for the perfect Rialto home? Buying or selling a home in Rialto? Call Snyder Real Estate Group at (561) 951-9301. Our community of Rialto real estate agents will help you navigate the Jupiter housing market in Florida. To buy a home in the Rialto real estate market, expect a range of list prices. Listing prices in this subdivision, on average, span from the mid $500’s to the upper $900’s. These luxury homes with Mission and Mediterranean-influenced architecture have a concrete block construction, tile roofs, and high-end interior finishes that may include an en suite with a Roman tub, stainless steel appliances, and a private backyard pool with an expansive tile patio. Homes in Rialto have a 2- or 3-car garage, 3 to 6 bedrooms, and 2 to 5 bathrooms. Newer constructions with almost 5,000 square feet of living space may be available as well. The on-site amenities at Rialto are numerous. Residents enjoy the large outdoor pool plus hot tub and sun deck with lounge chairs. 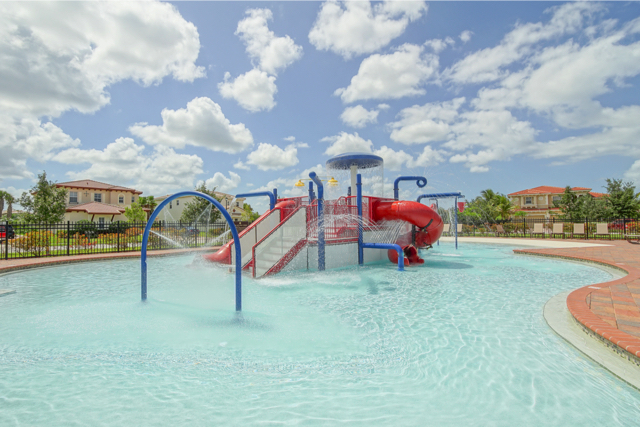 For the youngest residents, there’s a kid’s pool with splash area and a large playground. Meet a neighbor in the entertainment/social building for coffee or a game cards or get a work out in at the state-of-the-art fitness center. The fitness center has multiple treadmills, free weights, and an adjacent area just for the kids. Estates Collection homes in Rialto are typically priced between $650,000 and over $1,000,000 while the Executive Collection homes list from the $300,000's to over $500,000's. The lot sizes in Rialto are especially large compared to other newer communities. The Estate homesites offer 1/3 to 3/4 acre lots and the Executive homesites are approximately 1/4 acre. All homes within the Rialto development range between 1,800 square feet and 4,500 square feet of living space while some of the specs include a 2 or 3 car garage, 4-6 bedrooms, 4-5 bathrooms, and a more modern Spanish style architecture. Jupiter and the community of Rialto are about 25 miles from the Palm Beach International Airport and less than six miles to the Jupiter Medical Center. There’s nearby shopping at the Jupiter West Plaza, the Green Turtle Plaza, and the Chasewood Plaza located off Route 706/West Indiantown Road. Living in Rialto means it’s easy to get to Jupiter area sites and attractions like the Jupiter Inlet Lighthouse and Museum, the Hibel Museum of Art, and the Palm Beach International Raceway. And with shops, restaurants, beaches, and many of Jupiter’s A-rated schools nearby, Rialto provides homeowners & residents with plenty of comfort as well as convenience. 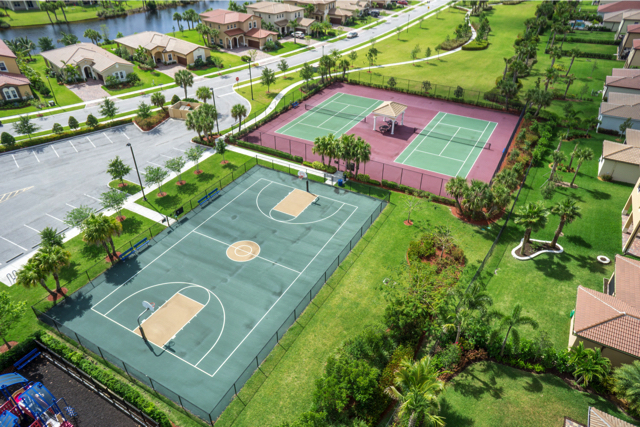 Community amenities associated with the Rialto Community in Jupiter include a resort-style pool, a spacious upscale clubhouse with state-of-the-art fitness center, tennis courts, a full-size basketball court, and a playground. In addition, plenty of walking and jogging paths run all through the neighborhood, which are ideal for walking the dog or getting in your daily exercise. 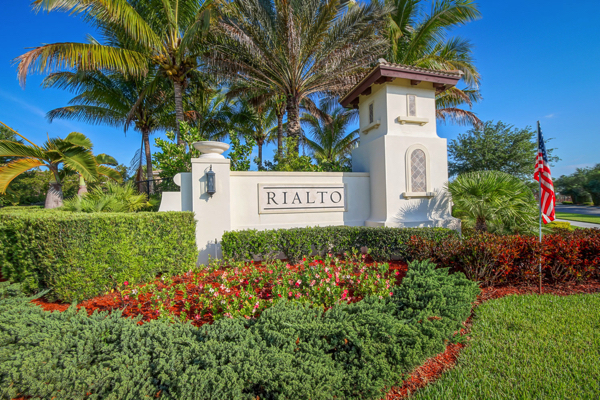 Rialto in Jupiter, FL is also a gated community, which provides all the privacy and security you could want in a brand new Jupiter, FL home and prices are extremely reasonable for new construction real estate. 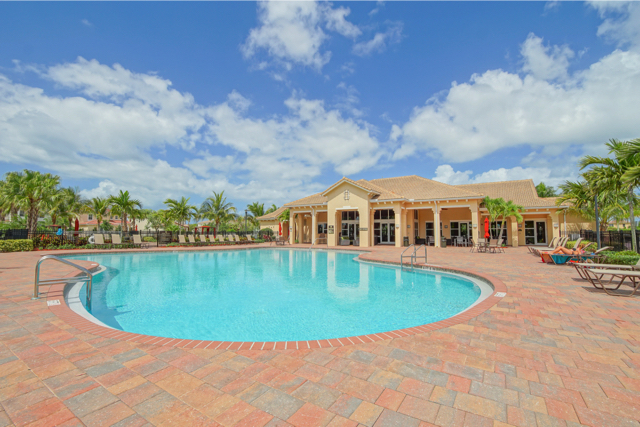 The Jupiter community of Rialto offers homebuyers the opportunity to find a newer construction, with luxury finishes and expansive living space. A resort-style, residential neighborhood, Rialto is close to a variety of places to shop, eat, and do business. Thinking of buying or selling a home in Rialto? Let our local Jupiter real estate agents help guide you through the purchase of your next property or expertly negotiate the sale of your current Rialto home. As local real estate agents, we're experts on the market dynamics unique to the Rialto real estate market. We'll get to work for you today! Contact Snyder Real Estate Group to learn more about buyer or seller representation. Planning to sell your Rialto home? Contact us to learn more about the possible resale value of your Rialto home!